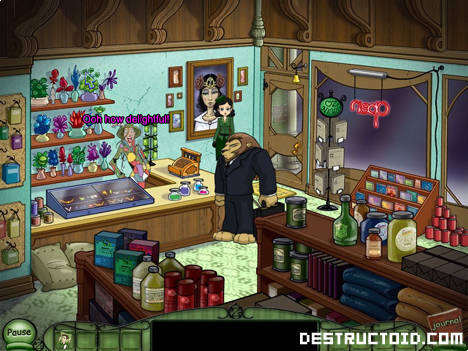 Point-and-click adventure games may not have the mainstream audience that they used to, but good titles are still being made for the genre. 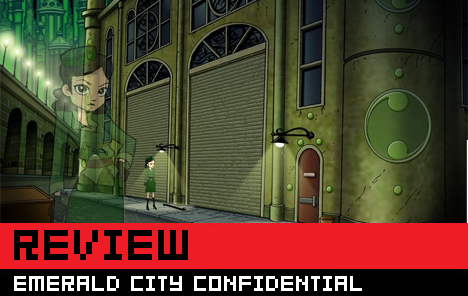 What caught my attention in Emerald City Confidential is the premise. It's a noir detective story set in the land of Oz. This means that it could either be an unequivocal failure or a really interesting spin on the setting. Which is it? You'll have to read the review to find out. 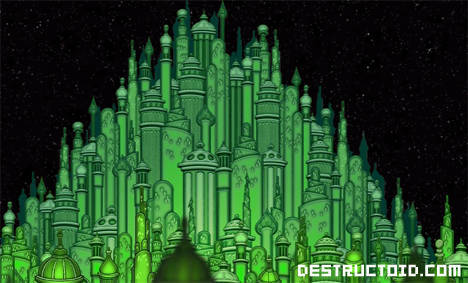 Join me as I delve into the heart of the Emerald City. The way I see it, there are two types of people in this world: People who are fans of L. Frank Baum's Oz series of novels and people who have only seen the 1939 film adaptation of The Wonderful Wizard of Oz starring Judy Garland. Either way, damn near everybody has some experience with and perception of Oz. So, to take something as well-known and even cherished as this setting is and attempt to make a satisfactory game out of it is fairly brave on the part of the developer. The writer is clearly a fan, as he draws together characters from across half of Baum's lengthy series of books and puts them in a darker, grittier Emerald City. Dorothy Gale and her companions who once traveled the yellow brick road from Munchkinland have all grown cold and weary. Magic has been outlawed and the guard use dogs to sniff out its use and imprison traffickers and users of contraband magical items. And Petra, the only private detective in the city, is hired with an inordinate amount of money to find a missing fiancé. So, this isn't going to be the Oz that you might recognize from film, but the setting is a fairly good representation of how things could have turned out for the city. Some of the characters may seem somewhat unrecognizeable, but it sets the mind to wondering how that person might have changed, with some answers given and some left to the player. As a story, it works out pretty well. The plot twists in several places, some of which are readily apparent, but a couple are a bit surprising. A plotline regarding Petra's missing brother feels a bit cheesy at times but manages to end in a rather satisfying manner. Visually, it's passable. Some of the backgrounds are really beautiful pieces of art, but there's a fuzziness around characters and animations are mediocre. There's something about the main character's design that really annoys me, also. It's like she's permanently in a state of huffy outrage. Voice acting is on about the same level. It's nice that it's there and some of the delivery is entertaining, but there are a lot of instances where you can visualize someone in a booth saying these words to a microphone. The actors aren't particularly immersive a lot of the time and scenes come off flat. The puzzles in the game aren't very challenging, but some are clever. The game really holds your hand for about the first half, guiding you swiftly to objectives and solutions for reaching them. The latter portion uses more subtle hints and require a bit more experimentation in some cases. It's much more satisfying to play, but you have to clear some of the more pedestrian portions of the game to reach the fun bits. 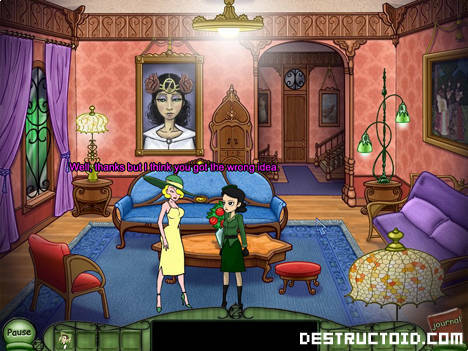 In the end, it's a solid but but unspectacular point-and-click adventure. It will scratch the itch to play games of its type but breaks no ground and does little to further the appeal of such games. Its moderate challenge level may be a little low for veteran players, who may find aspects of it disappointing. Still, it's enjoyable in bits and fans of Oz will have some fun seeing the interpretation of the world.